We’d love your help. 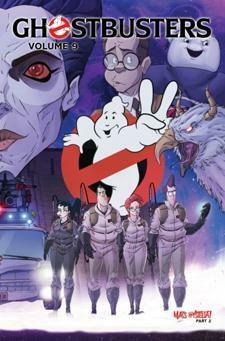 Let us know what’s wrong with this preview of Ghostbusters, Volume 9 by Erik Burnham. A chaotic presence promises unheard of catastrophe for New York City, and the Ghostbusters are at a loss for how to deal with it. Will the team have to make a deal with the devil to save the day? Find out in the conclusion to "Mass Hysteria"! To ask other readers questions about Ghostbusters, Volume 9, please sign up. Tiamat returns to the fray with a vengeance. Ray is possessed and Winston has to make a hard choice which effects more than just him. Unfortunately, the tale falters in this volume as they try to wrap up the storyline too quickly. Hopefully, there will be future tales of the Ghostbusters. WHAT DO YOU MEAN IT'S OVER?! Pardon the outburst. I love this comic but don't track news on any comic I read to any degree, so while I knew Mass Hysteria was going to be an 8-part story (the second half collected here), I wasn't aware until I got to the end that it is the end for the book entirely. Maybe they'll come back for a third run. They came back for a second, so there's some hope. But let's say this is it for a Ghostbusters ongoing. Let's call it done and judge it as it is currently meant WHAT DO YOU MEAN IT'S OVER?! Maybe they'll come back for a third run. They came back for a second, so there's some hope. But let's say this is it for a Ghostbusters ongoing. Let's call it done and judge it as it is currently meant to be judged: as the last four issues you have to enjoy. And, oh, I think you'll enjoy them. This picks up shortly after the last part of the arc leaves off, and everything's up in the air. The big bad is getting bigger and badder, and everyone's running around just trying to keep the lid on. It's well-paced with great character moments, and a final twist in the plot that is entirely saved from being a cliché thanks to the very last page of the story coupled with the "Where are they now?" quick hits at the end. This was that good, I want to watch both films right now ! The whole comic book series plotline could have been the long awaited 'Ghostbusters 3'. A loving homage to the original series of films. The series wraps up....'twas a fun ride. This series was superb. A true spiritual (no pun intended) follow on from the films. Both story and art have been excellent. I will go back to this again in the future repeatedly. Erik Burnham is a Minnesotan writer and artist that first broke into comics with a series of humorous short stories in the Shooting Star Comics Anthology. These stories featured his original creation, Nick Landime, and culminated in a one-shot: Nick Landime vs. the World Crime League, published by Shooting Star in 2005. Off and on, in this same time period, Erik also produced a short run of an onli Erik Burnham is a Minnesotan writer and artist that first broke into comics with a series of humorous short stories in the Shooting Star Comics Anthology. These stories featured his original creation, Nick Landime, and culminated in a one-shot: Nick Landime vs. the World Crime League, published by Shooting Star in 2005. Off and on, in this same time period, Erik also produced a short run of an online strip, The Down Side, until technical issues wore him down. He aims to return to the strip one day. In 2007, Erik found produced work for two other anthologies – a short humor piece for History Graphics Press’ Civil War Adventures #1, and a horror story for Gene Simmons’ House of Horror #3, produced by IDW Publishing. This lead to several other projects for IDW, up to and including his critically acclaimed run on the ongoing GHOSTBUSTERS comic book.